For those of our customers who use live streaming it should sometimes be interesting to see publisher streams statistics. Like if one has video calls. We didn't show this kind of info to avoid confusion of the majority of customers. So after a couple requests we decided to make this information to be an option for each server. If you go to servers list and choose Edit for selected server you can specify this setting. Enabling publisher streams for reporting. So once this check box is unchecked and server settings are saved, your Full data slice will begin showing incoming streams information. If you wish to see separate report for this, you must create one more slice and indicate an application which contains publisher stream. 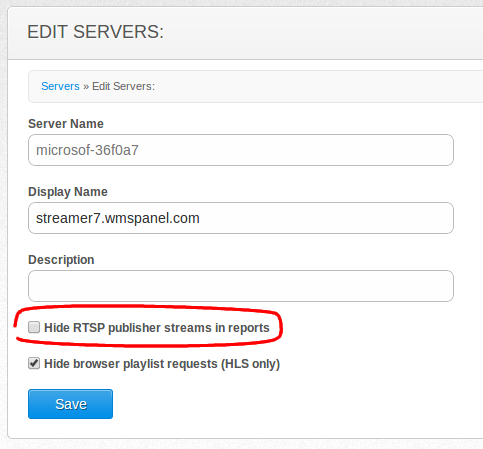 Sign up today to see those publisher streams in your reports. You can use WMSPanel free of charge during trial period and check out our full feature set.